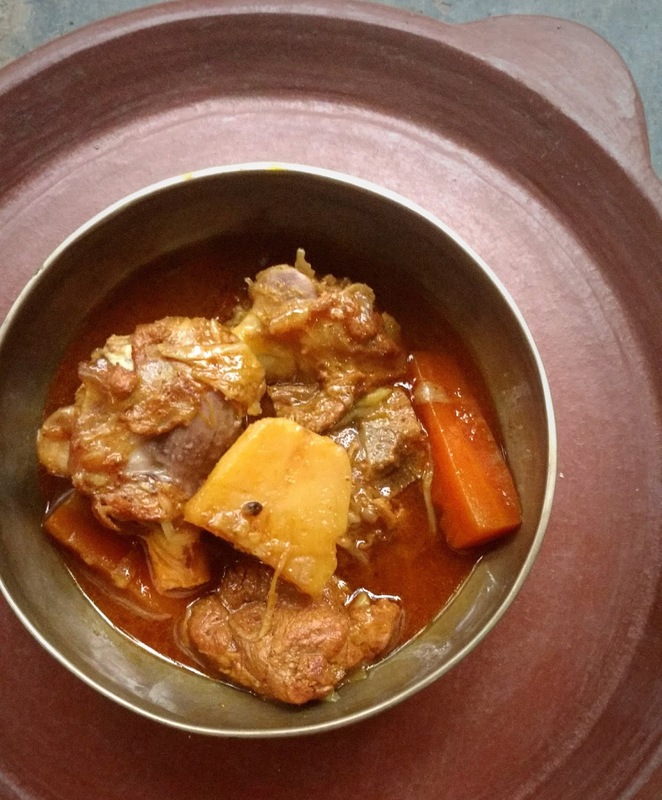 One of the ‘tastes’ of these holidays were ‘Mangsho’r jhol’ or mutton stew eaten with plain hot rice. This was my absolute favorite and was made every three or four days, or at least once a week if I remember correctly. Chicken was not on the menu very often. Bengalis prefer mutton. The mutton would be bought from a particular shop, and the butcher would be given a severe warning- the grandchildren are visiting, so make sure you give tender mutton that they will be able to eat easily, not an old animal which will make their jaws ache from chewing and chewing!! I would be excited waiting in anticipation, hovering near the kitchen, watching to see how far the cooking had progressed. Very often Didin would give us a small bowl of the Jhol with a piece or two of mutton and a nice piece of potato to ‘taste’ and then verify that it was quite alright … how I miss her indulgent love..
Here’s how Mangsho’r jhol was made in Didin’s house. 4 large potatoes, peeled and cut into large pieces. 4 carrots, peeled and cut into thick sticks or large cylinders. Wash the meat and drain excess water. Don’t wash too much, just a quick rinse. Take a clean vessel and put in the meat to marinate. Add the fresh curd, ginger garlic paste, powdered spices, salt and mix thoroughly. Make sure the meat is well coated in the marinade. Let it marinate in the fridge for a good 3 or four hours. In a pressure cooker heat the mustard oil till it just smokes. 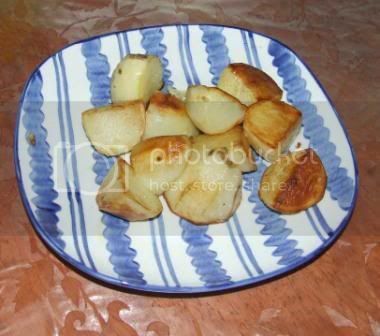 Reduce the flame and fry the potatoes till golden, infact even a dark brown… remove to a plate. Then put in the whole spices. Increase heat if required. Stir for a minute till the aromas are released and then add the sliced onions. Stir well so the onions don’t burn. Let them fry on a low flame till they turn brown. You must keep an eye on them. Sprinkle a teaspoon of sugar and mix well to let them caramelize. Add the marinated mutton to the onions and mix well. Let it fry for about 10 minutes turning and stirring every 2 to 3 minutes. Add the remaining marinade if any is left in the bowl. Mix thoroughly. Once the meat has changed colour evenly, add the potatoes, carrots and a cup and a half of water. Use your judgment - there shouldn’t be too much water or the gravy will be thin and watery. Shut the pressure cooker and let it cook on a high flame. At the first ‘whistle’ simmer down the heat and let the mutton cook under pressure for 10 minutes by the clock. Once you have switched it off, let the cooker cool completely before opening. Your mangsho’r jhol is ready to serve. It tastes great with rice and also with plain parathas. Don't know if it is the picture or the narration, but I AM HUNGRY NOW. Wrong time to be. this looks so yum,..:-)enjoyed reading ur post...made me remember my childhood,.. It was always a Sunday lunch, I remember starving all morning to have that 'patla mangshor jhol'. It's such a comfort food.